Top 7 Exercises To Prevent Low Back Pain! Have you tried various treatments that didn't work? 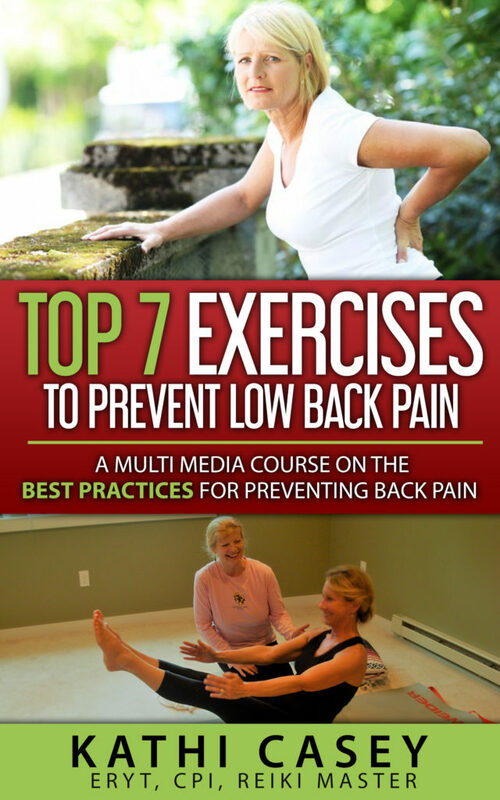 Want to learn 7 simple exercises which can prevent your back pain and give you a better life? At last - a multi media course that will show you exactly what the CAUSE of your back pain is and how to address it so that you can kiss that pain goodbye! Includes videos, photos, descriptions and much more! A Real Bargain for $59.99! 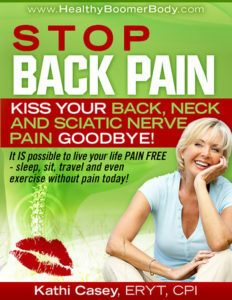 "STOP Back Pain–Kiss Your Back, Neck And Sciatic Nerve Pain Goodbye!" Everything you'll need to understand how your back pain is caused and the MANY options for healing that are available to you. Kathi also includes her own "Three Step Approach" for healing back pain - Relaxation first, then stretching and finally, strengthening. The way to STOP your back pain without dangerous prescription drugs! Click here for more information, or click below to go to Amazon and purchase. This lovely little tool can be used to massage your pain away and make you feel like a kid again. 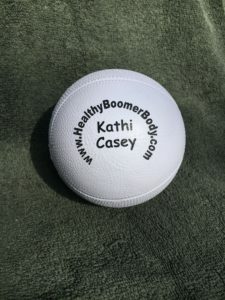 If you suffer from sciatic pain, neck and shoulder pain, knee or foot pain, then this ball and the accompanying eBook are just what you've been looking for! Fast Pain Relief!!!! AND - without harmful prescription drugs! Get Rid Of Sciatic Pain! A simple, three exercise program to help you say GOODBYE to piriformis syndrome or sciatic nerve pain, without medication, and to keep it away for good! Best of all, these exercises work for any leg or low back pain. They open your hip joints, bringing you the flexibility that helps keep arthritis and osteoporosis away, enabling you to enjoy your life again. Kathi demonstrates several different ways to do these exercises so that everyone can do them! More info HERE! Only $9.97! Get Yours HERE! Want to go "All in?" Kathi's Ultimate Pilates Program is the most complete pilates program on the market today. She demonstrates many modifications so anyone can do these essential core strengthening exercises. Includes Beginners, Intermediate, and Advanced programs as well as her “Acu-Pilates” Program, a one-of-a-kind program of Pilates exercises combined with Acupressure points to help balance your immune system. All FOUR of Kathi's DVD's and beginners eBook, on sale now! Click Here for more info, or BUY NOW ON SALE - ALL for only $12.00!